Today is the second anniversary of Ondoy. And it’s been raining all day thanks to Typhoon Pedring. Signal #2 has been raised in Metro Manila. Not good. Water level in the creek is still safe. Our road is under construction and it would NOT be good if we get flooded tonight. It will be all mud everywhere. I wouldn’t want to walk in that road tonight. What shoes to wear? I bought a new umbrella today. It was raining and I had no umbrella in the car. I had to buy it. Yes it’s violet. Was going for the blue one, but then I saw it in pink. The nice sales dude picked out violet for me to match my jacket. Sold. Haha. It’s going to be my car brolly. It’s big and won’t ever fit in any bag I can carry. Rainy weather is conducive for Pinning. Pinterest. Here are just a few of my recent pins/repins from today. So many lovely things found there, and cupcake recipes too. And crafts. I bet almost everything’s there, from baby shower invitations to crochet patterns to Wedding inspirations and even organization ideas. Everything. Anyhoo. Best to stay indoors if you don’t have to be anywhere important. Check out Pinterest if you get bored. The Yes! Magazine July 2011 issue featured comedians in their homes. One of the five featured was Pinoy Big Brother Big Winner Melai Cantiveros. We are a Kapamilya household and we watch almost all of their shows, including their reality TV hits PBB, Pinoy Dream Academy, and the more recent The Biggest Loser Pinoy Edition. I wasn't a Melai fan. I don't remember if I was rooting for anyone to win the PBB of her time but I remember being annoyed by her sometimes. Seeing her dolled up in the magazine feature - she's come really far. She is pretty! Promise! Ang Ganda, ang kinis! She tends to look like a female version of Kengkoy when she makes funny faces and distorts her expressions. If she doesn't do that, she can really look beautiful. She gives me hope. Hehe :) Magpapa-facial at body scrub na nga ako regularly. The camera I use the most these days, is the one on my iPhone. It makes sense, it’s with me everywhere. It’s come to the point where I’m thinking of getting a book on iPhoneography. And because I bring my phone everywhere everyday, it’s getting a little worn out. Serves me right for not using the cheap cell phone cases I got for it. The last one I used on it was a bumper protector that was quite loose, I don’t really it did much protecting, huh. That’s a hard case for the iPhone4 and it’s what I use now. I love it. It even has this To: and From: bubbles on the interior side, cute touch. There were other pretty designs, even ones with a black base that would look formal and suitable for work, but this is what I picked. I’d love to be a concert bear and play music for a living. If I can live that dream through my cell phone accessories, why not? Haha! The case was delivered (I realize now that the delivery fee was overkill!) around two weeks ago. It came with a screen protector too. I haven’t replaced the one on my phone yet, but I should – it’s got a lot of scratches already. I also have a black pouch that I use for the phone when I remember to take it out of my bag. One thing I’ve missed is being able to hang charms on my phone like I used to. I don’t even remember where my old charms are now, but I loved those. Made it harder to lose them phones with those hanging about. And you could easily identify it if someone stole it, bwahaha. On planning this post, I knew I wanted photos to be part of it. But because I don’t tag my photos like I should, and I have them in two separate EHDs, finding the right ones will be tedious. I have a love affair with sunglasses. I love them, but I have yet to find a pair that love me back. Seriously. Now I don’t even know where this pair is. Nor the other pair that I actually liked. 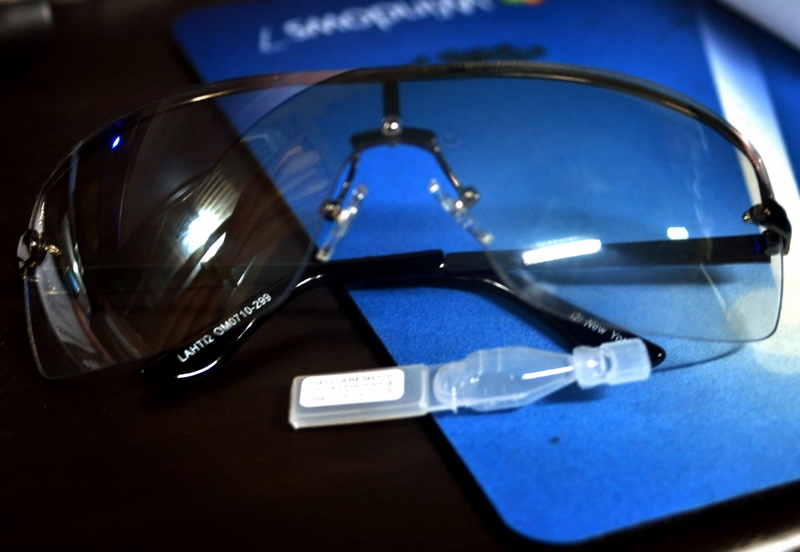 I got them because my eye doctor wanted me to wear glasses all the time to protect them from glare, and allergens. I love that excuse, but I just haven’t found glasses that fit. I know there are so many out there, but none that seem to match the shape of my huge face. More than that, I haven’t found one that I was comfortable with. Most of the time, they make me dizzy. I realize that I’ve only been trying on the cheap ones you find in the malls. Perhaps, I should check out the pricier ones and consider them an investment. Ms. Daphne has this post up on Eyewear and it literally opened my eyes to the beauty of sunnies, hehe. They’re all so pretty, and I see how glasses can compliment a look. I’m not fashionista (wish I were) but if I can’t get pretty clothes, I’ll go for accessories. And glasses make good accessories. Looking at a catalog of Native Sunglasses, I think there is hope for me to find something I can really use. When the boyfriend bought his most recent eyeglasses last year, I spied a pair that I want but couldn’t commit to. It was costly around 6000 pesos. They were willing to change the lens to coated clear prescription glasses for me. I should visit that shop again, maybe they still have something I’ll like. We were driving home yesterday and the sun kept getting on my eyes. The sun visor was no help, I didn’t feel safe pulling them down but that was the only way I could look out. I definitely need shades while driving. Last night was Julia Roberts’ night on HBO. One of my favorite movies of hers was on when I tuned in – Mona Lisa Smile. I loved this movie the first time I saw it, and I still watched it from beginning to end last night. As soon as I could, I searched my blog archives for the post I was sure I published about the movie. There was none to be found. A quick google search didn’t show me anything either! I tweaked my search terms and there it was! I was still on tBlog when I saw the movie in 2004. What do you know. The movie is 7 years old. And I still love it. nice movie, really. :) i actually liked it, i cursed at our VCD player sooo many times cause it was acting up while my big brother and i was watching the movie. i'll probably watch it again at the cinema. heard it's scheduled to open on the 4th of february. gotta convince boyfriend to go watch it with me. or maybe joy would be interested. anyway, i agree. the movie was as much about contentment and success as a construct as it was about women's lib and conformity. i remember having been in a similar discussion with friends before. someone mentioned that she didn't want to end up "just" a housewife. and someone commented on the term "just" or "lang." homemaking is indeed a career choice. as in any other occupation or career, it's something that any woman can and may choose to pursue. my generation of young women grew up with mothers who have chosen a career outside the home. still there are those who stayed at home to care for their children and mind their household. our grandmothers are more of the homemakers type. perhaps they weren't given the same choices our mothers had. but even if they were given the chance, would they have chosen to leave home? ah, those were different times. Joanne, Julia Stiles' character, apparently chose to get married and stay at home rather than pursue her dream of becoming a lawyer. but that was her choice. she was given every chance to choose another path, but she chose that particular one. and she was happy with it. content. the poster girl for women's lib shouldn't be the successful career woman. she should be the educated, smart and successful homemaker. women's lib. it's about women being respected enough to be trusted to make decisions for themselves and the people around them. it's about being on an equal status with men. of equal opportunities. women may make wrong decisions, but at least they chose it themselves. others did not choose for them. success and contentment are different for every person. it's a factor that contributes to how people make a choice. if success was being praised for being such a good lawyer, then Joanne made the wrong choice. but if it was about raising a family and being with someone (you're better half) then she had made the right choice. conformity. we can choose to be like the others, or we can choose to break free. as their farewell gift, the students left Ms. Watson their own Paint-by-numbers version of Van Gogh's work. instead of "conforming" to the assigned shades to each number, the students gave it their own interpretations. their own colors and shades. some people may appear to conform, but another glance would show that they are not. a deeper view would tell us that the person is also a rebel in his or her own way. am i a conformist? i'd like to think not. but perhaps too, in a way, i am. ami i content? i used to think so. but now i am not so sure. for there is something else that i am aspiring for. higher pay is not the least of them :lol: but kidding aside, with happiness come contentment, i think. happiness and contentment sometimes come with success, but sometimes they don't. with real success comes both. guaranteed. but what is real success? it's a construct. to be defined by each individual being for his/herself. my success can only be measured by me. as your success can only be measured by you. not by the thickness of your pocketbook nor the vastness of your wealth. Things aren’t always as they seem. That’s something else I picked up last night. Ever had that feeling of losing something, and knowing you couldn’t have possibly really lost it? And yet you just can’t find it. You look high and low, retrace your steps, and its nowhere to be found. Then, at the very last place you check, there it is. All safe. Well that was me last night, not even 2 hours into my shift. I’d traversed the two production areas my account occupies, when that sudden feeling of loss got to me. It took some time before I found my badge – inside my bag’s pocket. I had no idea when I placed it there. I still remember putting it on the back pocket of my pants, not my bag. I really think that printer services and supplies would be a good idea for a business. There are ready markets for campaign items and company swags like this simple lanyard. Specially for holiday giveaways. It doesn’t seem like one needs too much investment for the business to take off. Just enough contacts as a customer base, and superb quality service., and you’re good to go. I’d pretty much thrive in a creative business venture like this one, I think. In my office alone, we’ve ordered custom ID laces, lanyards, mugs, tumblers, etc. All with our logos printed on them. We’re probably going to have more done before Christmas. Anyway. Tonight, my badge will be a little secure. Until the next mini-crisis.